KARACHI: In the wake of a Supreme Court directive to the provincial government and local government to demolish around 500 buildings constructed by commercialising the plots meant for residential purposes, the Muttahida Qaumi Movement-Pakistan on Saturday appealed to the SC to review its decision “in the larger interest of the public”. Just a day earlier, Local Government Minister Saeed Ghani of the Pakistan Peoples Party had also expressed his reservation over the orders to demolish multistorey commercial buildings on residential plots, saying that he had utmost respect for the superior judiciary but would prefer to quit his office than to render people homeless. On Saturday, accompanied by Karachi Mayor Wasim Akhtar, Dr Siddiqui held a press conference at the party’s temporary headquarters in Bahadurabad to air their concerns over the Supreme Court’s directives. About directives to raze marriage halls, the mayor said that immediate implementation of these orders would directly affect thousands of families who had booked these lawns for the marriages of their daughters, sisters. “This is a matter of human rights,” he added. He said that it was not a matter of encroachment as it was related to change of land status from residential to commercial. “We are not afraid of going to prison for the solution of people’s problems,” he declared. Dr Siddiqui, however, made it clear that his party also wanted removal of encroachments in the city, but an investigation to ascertain the legal status of these buildings was necessary. “We respect the court order regarding restoration of Karachi to its 40-year-old state. 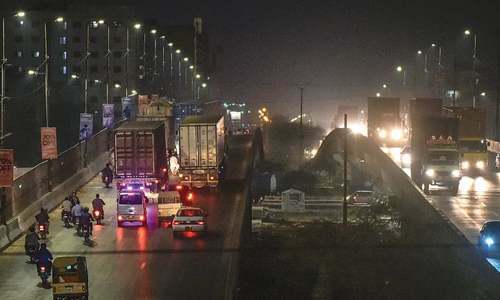 However, it must be investigated that how the Sindh Building Control Authority had given permission for these illegal constructions,” the MQM-P convener said. “Manzoor Kaka should be asked as to how these buildings were constructed,” he said, referring to a former chief of the SBCA who reportedly fled the country to escape corruption charges against him. He said that those who gave permission for the construction of these buildings would not be affected if these spaces were demolished. “It is our demand that no one be rendered homeless without making an alternative arrangement. The Sindh government should take steps in this regard,” he added. He demanded that a committee be constituted under the supervision of the Supreme Court to conduct accountability of the past 40 years. The MQM-P leader said that the Karachi mayor, who is also the deputy convener of the party’s coordination committee, had already stated that he would resign even if a single house was demolished in the name of anti-encroachment operation. He said that hundreds of katchi abadis in the city created in the name of the Goth Abad scheme should also be looked into.